Many of us have difficulty falling asleep at night. It’s a common problem, and I personally struggle with it. It’s not that I’m not tired – I am. It’s just really difficult to silence my mind. As I’m trying to sleep, my mind often wanders as I think about countless thoughts. At times, it can take me an hour or tow just to fall asleep. It’s no secret that sleep deprivation is unhealthy. We need an average of 6-8 hours a sleep each night in order to function at our optimal levels during the day. Being tired and sleep deprived destroys productivity and can lead to long-term health issues. 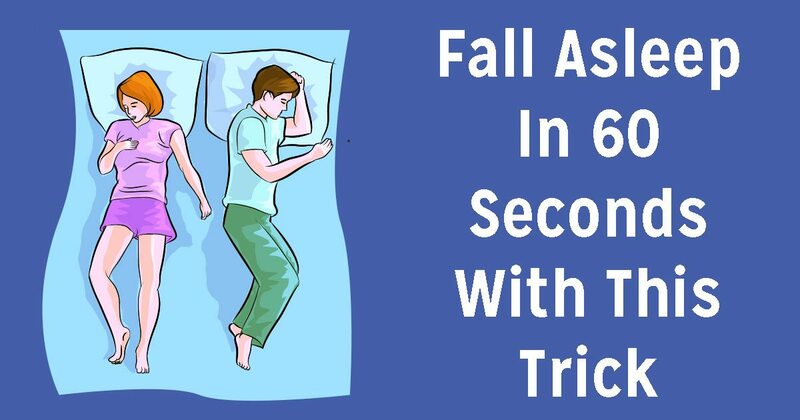 Fortunately, there’s a nifty little trick called the “4-7-8” breathing technique that will help you fall asleep in just 60 seconds. Developed by Dr. Andrew Weil, this technique is extremely easy to follow. It blends meditation and breathing in a way that helps your body counteract stress. The idea of the technique is to breathe in through your nose for four seconds. Hold this breath for seven seconds. Then exhale for eight seconds. Repeat this three times and you should fall asleep. The technique calms your heart rate and relaxes your body. Learn more about it in the video below, and be sure to give it a shot tonight. Please SHARE this trick with your friends.